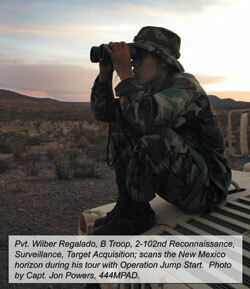 More than 200 New Jersey Guard Soldiers directly supported the border protection effort. The rotation began with two days of mission specific training at the New Mexico National Guard Regional Training Institute in Santa Fe designed to set the baseline of knowledge on equipment and radio procedures used in the interagency border protection mission. The program of instruction also included refresher training in combatives, weapon retention, ground fighting and hand-to-hand combat. The 2nd Squadron, 102nd Cavalry were tasked to augment the durational force from the Arkansas National Guard near Las Playas, N.M., and elements of the 3rd Battalion, 112th Field Artillery; G Company, 250th Brigade Support Battalion and 1st Battalion, 114th Infantry supported the Georgia Army Guard in Deming, N.M. The New Jersey Air National Guard supported both locations with medical services teams that provided on site emergency medical capabilities. 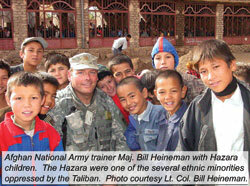 Chief Warrant Officer 2 Mickey McGuire (left), 50th Main Support Battalion and Lt. Col. John Nunn, 42nd Division Support Command, pose with Iraqi children. 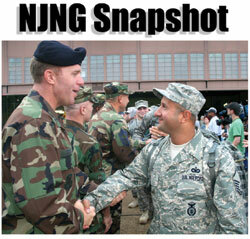 Nunn went on to become the first Operation Iraqi Freedom New Jersey Guardsman to make Brigadier General. Photo courtesy Chief Warrant Officer 2 Mickey McGuire, 50MSB. In 2006, the 177th Fighter Wing (Jersey Devils) Security Forces Squadron deployed a 13-member detachment to serve as the Quick Reaction Force (QRF) at Kirkuk Regional Air Base, Iraq. The QRF was the only mobile security team available to respond to intrusion attempts and other incidents on the base and outside the wire when needed. The Jersey Devils responsibilities included conducting unexploded ordnance sweeps after rocket and mortar attacks, security patrols and casualty evacuations and served as a blocking force in the event of attacks and elevated force protection conditions. The team routinely provided protection for civil engineering and other missions outside of the base’s perimeter. On several occasions, the detachment provided personal protection details for visiting U.S. and Iraqi dignitaries. The New Jersey Army National Guard fielded and mobilized a 16-member Embedded Training Team in support of Operation Enduring Freedom as part of Task Force Phoenix. Following an intense pre-mobilization training program at Fort Bliss, Texas, the ETT deployed to Hirat, Afghanistan where it worked against Anti Coalition Insurgency Forces. The team principally advised, supported and operated with the Afghan Army’s 207th CORPS from February 2006 through June 2007. The ETT played a significant leadership role in developing a tactical and strategic vision that unified the multi-national, multi-service command and fostered strong supportive relationships between the Afghan National Security Forces, International Security Assistance Forces, Combined Security Transition Command-Afghanistan, United States Department of State, National Defense Directorate, Italian Operational and Mentoring Liaison Teams, DynCorp, MPRI, and United Nations agencies. The ETT contributions assisted the 207th CORPS to be the first region in the Afghanistan to successfully transition all national security operations to Afghan National Security Forces control. The team, which participated in more than 120 combat missions, was highly praised for its actions and contributions and received multiple unit and individual awards from Coalition partners as well as the U.S. Army. 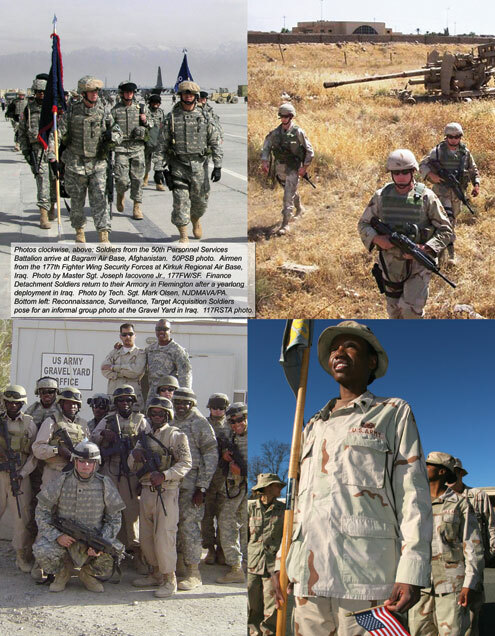 The 50th Personnel Services Battalion (PSB), along with soldiers of the 250th Personnel Services Detachment (PSD) deployed to Afghanistan in late February 2006. Upon arrival at Bagram Airfield, the PSB completed relief in place operations and deployed teams of Soldiers throughout the Combined Joint Operations Area to service the Warfighters and area support elements. soldier records management, promotions, personnel evaluations, human resources information systems management, ID cards, passports, and R5 (Reception, Replacement, Return-to-Duty, R&R, and Redeployment) in the Afghanistan Combined Joint Operating Area. The leadership of the 108th ARW says farewell to Master Sgt. Valentino Lopez as he prepares to leave McGuire Air Force Base for a deployment in support of Operation Iraqi Freedom. Lopez is part of the more than 70 108th Air Refueling Wing Security Forces Squadron Airmen who deployed to Iraq in support of Operation Iraqi Freedom on Sept. 15, 2007. The unit made history as the first National Guard unit in charge of security at Baghdad Airport in command of Air National Guard, active duty Air Force and Army and a foreign contractor security team. The deployed Airmen returned to New Jersey on March 24, 2008. Photo by Staff Sgt. Barb Harbison, 108ARW/PA. The 50th’s most significant impact was the innovative restructure of the existing postal service operations. The changes developed and implemented were massive and had an immediate positive impact. A Mail Movement Team (MMT) was established with the sole purpose of maximizing the use of space available on aircraft and ground vehicles. The Team was responsible for coordinating with the movement control battalion and Air Force and coordinating and synchronizing all mail deliveries to Forward Operating Bases (FOB) theater- wide. An extensive customer service plan was also developed and implemented. Commanders at remote sites were constantly kept in the loop on the status of mail deliveries to their FOB and were immediately advised of delays and were told when the next delivery attempt would be made. The 50th’s re-written postal doctrine resulted in a drastic reduction in delivery delays, and Soldier complaints. 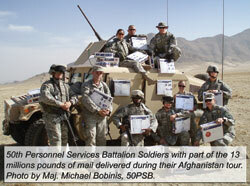 During the yearlong deployment, more than 13 million pounds of mail were processed and delivered. In March 2007, the 50th PSB transferred authority to the 147th PSB from the Minnesota National Guard and returned to New Jersey to conduct mobilization out-processing and reconstitution, completing its highly successful 14-month deployment in support of Operation Enduring Freedom. Photos clockwise, above : Soldiers from the 50th personnel Services Battalion arrive atBagram Air Base, Afghanistan.50PSB photo. Airman from 177th Fighter Wing Security Forces at kirkuk Regional Air Base, Iraq. Photo by Master Sgt. Joseph lacovone Jr., 177FW/SF. Finance Detachment Soldiers return to their Armory in Flemington after a year long deployment in Iraq. Photo by Tech. Sgt. Mark Olsen, NJDMAVA/PA. Bottom left :Reconnaissance, Target Acquisition Soldiers pose for an informal group photoo at the Gravell Yard in Iraq. 177RSTA photo. That statement unlike any other describes the men and women – the Citizen-Soldiers and Citizen-Airmen that comprise the New Jersey Army and Air National Guard. Yet no single word or statement can best describe your service and sacrifice and, more importantly, your willingness to serve your community, state and country. You come from nearly every city and town in New Jersey. You are students, business owners, lawyers, doctors – the list of occupations is endless. Some of you can trace your family roots to the beginning of this country, while some of you have just came to the United States. Whenever there is a crisis – a flood, a hurricane, a snowstorm or some other natural disaster, you are there. When terrorists used aircraft as weapons; you came, unbidden, in uniform to the armories and to the air bases ready to do whatever you could. When the mobilization call-up came, you were there, ready to be trained, ready to leave everyone that you love and ready to lay your life on the line. No one knows how long the Global War on Terror will last. Some have said it will last years; others say it will last generations. The next few years will not be easy. The path has been set before us and the consequences of failure or inaction will be nothing short of catastrophic. For everyone and everything that we hold dear, we must continue to shoulder the burden, for if we don’t do it, who will? 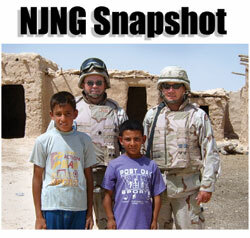 In the end, regardless of the duration, the New Jersey National Guard will prevail.